On May 21, the Senate Judiciary Committee concluded debate on the “Gang of 8” immigration reform proposal, passing the amended legislation onto the full Senate for consideration. A significant component of the bill is a set of “border security triggers” that the Department of Homeland Security (DHS) would have to accomplish before the pathway to legalization and citizenship would become available for most immigrants. These “triggers” include “persistent surveillance” along the entire expanse of the Mexico/U.S. border and a Border Patrol “effectiveness rate” of 90%—signifying that the agency is able to successfully apprehend at least 90% of unauthorized migrants in each of its nine southwest enforcement sectors. In popular discussion of the Senate bill, surprisingly little attention has been devoted to scrutinizing these so-called “triggers”—despite their significance to the overall reform effort. Perhaps this is because many in the immigrant rights movement have come to support the triggers as a “common sense” tradeoff for the more progressive reforms that the bill may include (for example, Ali Noorani, executive director of the National Immigration Forum, told the LA Times on April 29: “Opponents of immigration have used border security as an excuse. This [the triggers] will put pressure on them”). Yet given that so much would ride on accomplishing these measures, it is important to scrutinize DHS’s past and present failures in pursuit of precisely these objectives, alongside an independent metric for evaluating its operational “success.” This is especially the case given that over the past 10 years both the size and operating budget of the Border Patrol have more than doubled, with devastating effects on human rights, the environment, and the wellbeing of border communities. In pursuit of the quixotic task of “border security,” the Senate proposal would exacerbate these trends, while maintaining a punitive, “enforcement first” approach to immigration policy. To begin to unpack the Senate’s proposed “border security” triggers, consider the concept of “persistent surveillance,” an objective that has long been a vexing challenge for the Border Patrol. To overcome these challenges the Border Patrol has spent billions of dollars on infrastructure, personnel, and a series of high-tech surveillance initiatives commonly referred to as the “virtual fence.” For example, from 1998-2005 the agency spent $239 million on the “ISIS” system, an assemblage of integrated ground sensors and high-resolution video cameras that would allow agents to gain “situational awareness” of remote, mountainous areas. Yet by 2006 the DHS Office of Inspector General reported that “more than 90 percent of the responses to sensor alerts resulted in false alarms, something other than illegal alien activity, such as local traffic, outbound traffic, a train, or animals. On the southwest border, only two percent of sensor alerts resulted in apprehensions.” This was in fact a lower success rate for the ISIS sensors than obtained under the “legacy” system that ISIS was designed to replace. Yet despite lofty rhetoric about its technological sophistication, SBInet, in the end, proved an unmitigated failure. Software interface problems slowed communication between various components. 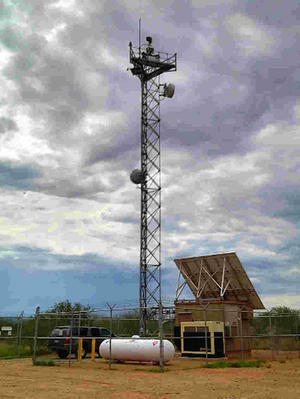 Animals and rainstorms triggered radar and ground sensors, and southern Arizona’s mountainous, canyon-filled terrain blocked cameras at various angles and degrees of proximity. After visiting an SBInet demonstration site, U.S. Rep. Chris Carney described one of the system’s shortcomings: “[a]s two immigrants tried to cross in front of a project camera, a technician tried to electronically reposition the camera to track their whereabouts. The picture was out of focus, the camera moved too slowly, and the immigrants got away.” Despite these problems, the Obama administration renewed the program with considerable fanfare, stating in May 2009: “This is the initiation of the no-kidding, real, SBInet system. . . We understand this a lot better. We're a lot more sophisticated.” By February 2011, with mounting costs and continuing setbacks, the program was quietly canceled. 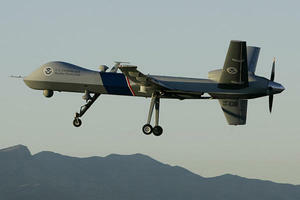 Regardless of the problems with its drone fleet, Homeland Security is fully invested in the technology, with plans to expand its fleet to 24 “Guardian” and “Predator” drones by 2016, at a total cost of $443.1 million, and to incorporate new capabilities like “signal interception receivers” that tap into and monitor cell phone and radio signals. The Senate bill would fund this expansion, with Arizona Senator John McCain arguing, “I am confident that the technology and surveillance capability as well as the drones will allow us to have effective control of the border.” But the Senator is shooting in the dark. As will be shown below, neither DHS nor congress possesses any objective framework for evaluating its technology that could lend support to such a claim. Over the last decade the U.S. government has spent more than $100 billion on border security, and with an annual budget of $18 billion for immigration and border enforcement, the U.S. is spending more on these efforts than all other federal law enforcement combined. The Border Security, Economic Opportunity, and Immigration Modernization Act of 2013 would infuse an additional $6.5 billion to expand the technology, manpower, and infrastructure available to the Border Patrol. This would include: 3,500 new agents; a “Southern Border Fencing Strategy” to include double-layer fencing, infrastructure, and technology; and sufficient drones to operate “24 hours per day and for seven days per week” along the southwest border (though precisely where these drones would be deployed or prioritized along the 1,933-mile-long border remains unspecified). Yet there is little reason to believe that this mix of agents, walls, and UAVs will somehow achieve the capabilities that congress would mandate. Indeed, as the Government Accountability Office (GAO) reported in February 2013, “without documentation of the analysis justifying the specific types, quantities, and deployment locations of border surveillance technologies,” DHS itself has no idea how effective any of these technological components or enforcement practices are. The inability to develop or stick with an objective metric to evaluate its practices has been the cause of considerable consternation and criticism from congress, most significantly from Republican border security hawks like Michigan’s Candace Miller, chairwoman of the House Subcommittee on Border and Maritime Security. Indeed, the invention of border security “triggers” is likely a response to these concerns, forcing a metric on the agency to which congress could then hold them accountable. Yet there is little reason to believe that such a metric would be anything other than arbitrary. In the Tucson Sector, the Border Patrol’s supposed accomplishment of an “87% effectiveness rate” has lent steam to proponents of the Senate plan, claiming that DHS is on the brink of achieving the 90% effectiveness rate that the bill would mandate (a mandate that, under a May 9 amendment to the bill, would be extended to all southwest Border Patrol sectors). Yet, as the GAO stated in its February 2013 report, inconsistencies of classification, methodology, data collection, and measurement capabilities between sectors render figures such as that reported by the Tucson Sector essentially meaningless. The Border Patrol claims that the recent border-wide decline in apprehensions is an indication of the success of their enforcement strategy. There is reason to be skeptical of this claim. Research has consistently shown that the volume of unauthorized migration corresponds to the fluctuation of sending and receiving economies, and not at all to the intensity of enforcement efforts. Although the Border Patrol has conducted an unprecedented build-up of personnel, technology, and infrastructure over the past 10 years, one doesn’t see a dramatic decline in Border Patrol apprehensions until around 2007-2008, the exact same period as the economic downturn. With a gradual recovery has come a gradual increase in the number of undocumented crossings; apprehensions in 2012 went up about 10% (a trajectory that has since continued), and it is likely that the historically low numbers in 2011 will be seen as a nadir rather than the indicator of a broader trend. Even more important, however, are the percentage of crossers who have strong ties to the United States. Many of these individuals are essentially forced migrants, on the border as a direct outcome the Obama administration’s unprecedented deportation effort (averaging around 400,000 individuals a year). A University of Arizona-Ford Foundation study released in April 2013 reported that 28% of those apprehended by the Border Patrol now consider the U.S. to be their permanent home. As such, DHS is literally producing much of the population of migrants they then claim are a threat to be guarded against. 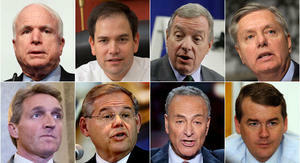 Because these individuals are presently absent from the United States, most will not qualify for relief under the current immigration proposal. And such individuals, separated from homes and loved ones, are likely to cross again no matter what the consequences or technologies deployed against them. The Senate architects are merely asserting—without any objective analysis or basis for their claim—that DHS can accomplish the border security “triggers” that their immigration proposal would establish. By hinging legalization and a pathway to citizenship on accomplishing these arbitrary objectives, such reforms could be postponed indefinitely. This is the great fiction that has thus far largely been ignored in debates about the merits of the Senate bill. And advocates on the left ought to think more carefully and cautiously about what they are being promised.